The Weather Channel got a lot of negative remarks about naming this historic storm "Nemo"
Frankly I am not really concerned about how a one cable channel goes about it's business, why be so negative about their efforts to spread the word about severe weather. Here in Montgomery County PA, we received a glancing blow from the merging storms. I spent yesterday watching radar images, station model wind temperature and wind direction. The barometric pressure was steady at first then in the early afternoon the pressure dropped rapidly (a clue of the low pressure system knocking on our door). To a weather aficionado like myself this event was like watching a good movie, a storm like this does not pass our way that often. This type of storm is something that scientists watch, record and study to improve forecasting techniques and sometimes create new high tech tools. Here is a pic that I took from my balcony this morning. I actually really like this picture because the light levels were just right. Unfortunately I was not feeling too well which prevented me from measuring snow totals last night and early this morning. 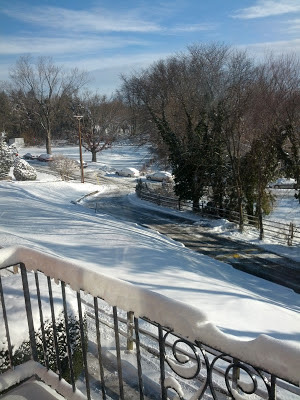 I hate to guess but I estimate that the snow total for Horsham (PA) was about 3 to 3.5 inches when all was done. There were many weather reports stating different snow totals, one must remember that when there is a complex storm like this that it is VERY difficult to accurately predict when and how much precipitation is generated. 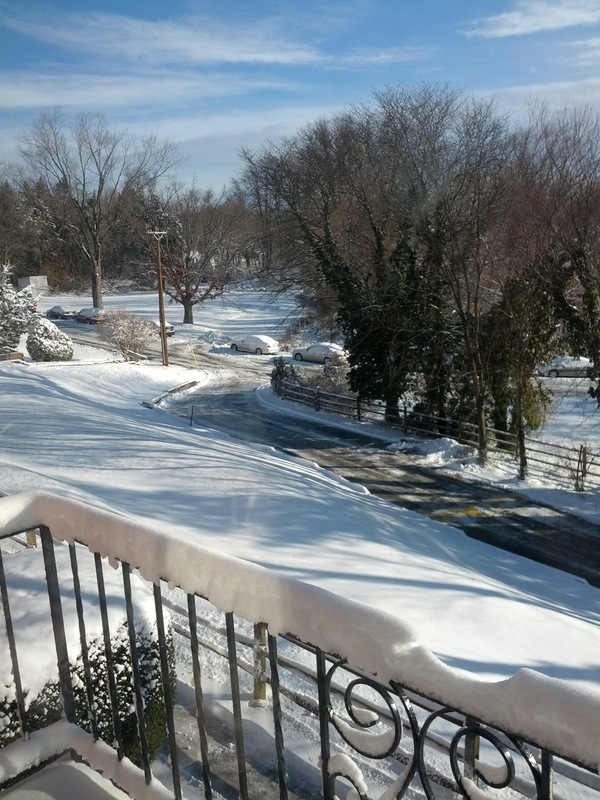 I for one think that Meteorologists did a very good job with their forecasts. Here is a great animated image from space (NASA) where you can see the two storm merging. How much snow do you think you received?